You want the time capsule project to be meaningful. For the project to be meaningful, first ask the reason for doing the time capsule. People are different, and so are the reasons they get involved with time capsules. For a family, one woman may be doing one for her baby. Another person wants to help her grandmother do one. Businesses celebrate anniversaries. It's good publicity and fun for employees, too. A merged business may use a time capsule. In this way they remember the past and celebrate something new. Products are important to businesses, and to time capsules they do, too. The time capsules we did for Disneyland's 40th and Heinz's 100th were product oriented. Disneyland included a cartoon cel and a 40th Birthday hat. Heinz included a bottle of ketchup and a letter from Prime Minister Thatcher. 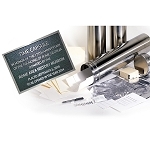 In essence, time capsules for businesses and organizations say "Yes! This business will endure." Government agencies go a bit further than companies. By their nature, any event must be public. A city turns 100. A county celebrates 150 years. A state marks its bicentennial of statehood. These are big deals! If no one cares enough to give you items or even come to your dedication, you may not feel it is successful. Here are some ideas to help with that. Enlist the aid of others by asking for help. Ask service groups to get signatures on a Signature Scroll. Or, have such a scroll at your events for attendees to sign. Make it special. You can sign your message for the future here! Ask for Letters to the Future! And how do they begin such a letter? Well, every time capsule has a reason for being. What is the reason for yours? Start with your own Letter to your future counterpart. For instance, entitle it "An Open Letter to the Time Capsule Committee Chairperson." You could then get others. A Letter to the Future Mayor of the City; Notes for the Graduating Class of 2116. The most successful letters speak from the heart. You can go on and on about the ways your city has planned for a wonderful future. That's good. But be frank about some of your fears, too. It is nice to have a birthday cake for your special anniversary, refreshments, and balloons. Put a display of photos of the items you put inside of the time capsule. Lay out special paper for folks to sign. You may want only signatures, or want signers to write lengthy messages. If you care how people sign (and if you'll have room), have the first person sign the way you want everyone to sign. If your event is public, get the word out. Use the local newspaper's feature articles to invite people to come and bring items. Use your Facebook, Twitter, and Pinterest pages to share invitations and ideas. 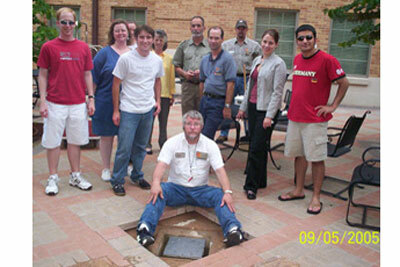 Ask the local schools to do essays, projects, or contests for the time capsule event. The things you put into your time capsule are important. You'll think long and hard to choose the right things to show what the time has been like here. Those will be special items you'll place inside. It's in our nature to place the best example of our work in the time capsule. You may wait for the first printing of that special history book, for instance. You may seek out the authors to sign and dedicate it. But you should consider certain problems we have faced, too. Problems are things that the future will end up seeing but not understanding. Once, a local county librarian I knew was in charge of opening an old time capsule. She told me, "As for coins, we only got one nickel from the old capsule. And it was a well circulated one." Disappointed with the old time capsule contents, she made an effort to get better things. She included a set of uncirculated coins and new paper money in the new time capsule. Now, what if she had read a little note along with that old nickel? Maybe there would be a story. "Mr. Stan Smith, the oldest man in the crowd, put a nickel from his pocket into the time capsule." Or, "In 1934, little Billy Frankovich put a nickel into the time capsule. He could've bought a big piece of pie at the Brown & Gold, but gave it up here instead." What you can do is record who donated that nickel, and why. It may not be as poignant as the examples above, but it helps those who open the time capsule. How? It shows something more about it than just the items. Showing who you are is not vanity, by the way. It helps, it saves time, and makes a more correct assessment later on. For a time capsule, at least, you don't need to reinvent the wheel. We've already got the container you need. You want the container to protect the things and to last. You don't want to worry about it. Well, just look at our time capsule containers and choose one. It's by far the simplest part of your project. And it should be. "We wanted to put this old fragile document in the new time capsule," a customer once told me. "It's in bad condition, but we felt it was important to include. It's one of the reasons we chose your company. We knew our items would survive much better than these did over time." Of course, you want to be glad you did the time capsule when the event's over. 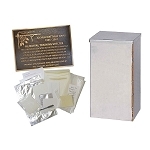 One of the biggest ways to do that is to keep in mind at every step of the way the reason for your time capsule. If you believe in the reason and the project's success, you'll be there.